The below artworks are the most important by Damien Hirst - that both overview the major creative periods, and highlight the greatest achievements by the artist. Artwork description & Analysis: The artist, with a huge grin on his face, poses next to a severed head in a morgue. Hirst selected the photograph and enlarged it in 1991 for one of his early solo shows, though it had been taken several years earlier. He said of the photograph, "I wanted to show my friends, but I couldn't take all my friends there, to the morgue in Leeds. I'm absolutely terrified. I'm grinning, but I'm expecting the eyes to open and for it to go: 'Grrrrraaaaagh!'" This early piece, indicative of his preoccupation with the relationship between life and death, is gruesome, satirical, and disturbing, evoking the conflicting feelings of repulsion and fascination many feel when confronted with the physical realities of death. In this way, Hirst's work returns us to the tradition of 17th-century Cabinets of Curiosities (specimens from the natural world, including parts of cadavers, arranged for public display), and acknowledges the eternal appeal of disturbing, even repulsive biological subjects. Artwork description & Analysis: Hirst's first solo exhibition, held in London in 1991, built upon his established reputation for using live animals in his work. The artist glued pupa onto white canvases, where they hatched into butterflies, fed on bowls of fruit, mated, and subsequently died. When asked what the work was about, he responded, "love and realism, dreams, ideals, symbols, life and death", and also "the way ... the symbol exists apart from the real thing. Or the butterflies still being beautiful even when dead." He admitted it was, "a crazy thing to do when in the end it's all art." The previous year, Hirst had displayed a significantly gorier work entitled A Thousand Years (1990), a glass case with maggots feeding off a bloody cow's head, which attracted the attention of Charles Saatchi, who would become his most important financial backer. While A Thousand Years had solidified his reputation, Hirst and his investor perhaps intuited that the public was not yet ready for such a work. Hirst revisited the theme of butterflies in an installation at the Tate Modern in 2012. Two windowless rooms were filled with live butterflies, brought in daily by the butterfly expert from London's Natural History Museum and swept up by the museum staff when they perished. While some viewers were distressed that the butterflies were not in their natural habitat (animal rights activists were not amused), others appreciated the opportunity to contemplate the fragility of life. As one viewer commented, "There's a terrific poignancy about them because their lifecycle is so short and they are vulnerable and delicate." Artwork description & Analysis: This is the work that established Hirst as a major presence in the art world. A little like the art world version of Jaws, this installation featuring a 14-foot tiger shark preserved in formaldehyde that capitalizes on the viewer's visceral response, a spine-tingling thrill one experiences in the presence of a good horror movie, knowing one is safely removed from the danger. The Physical Impossibility of Death in the Mind of Someone Living was among the works showcased in the Sensation exhibition of the early 1990s, the great succes de scandale" of the late-20th century and a game-changer in the art world. Charles Saatchi funded both the work and the exhibition, which were roundly condemned by art world conservatives from London to New York, and embraced by audiences eager for something new. On the meaning of the work, Hirst commented that the vitrines "first came from a fear of everything in life being so fragile" and explained that he wanted "to make a sculpture where the fragility was encased... [and] exists in its own space." Jeff Koons's Total Equilibrium Tanks (1985), a basketball suspended in a glass case, is an obvious precedent for Hirst's work. Dismissed by some critics as a "pickled shark," this has nevertheless come to be considered an icon of British art in the 1990s. Due to deterioration of the original specimen, the shark was replaced in 2006. Artwork description & Analysis: Since 1988, Hirst has been generating so-called "spot paintings", also known as The Pharmaceutical Paintings. This series are his most recognizable and iconic works, aside from his animal sculptures. No one knows how many there are, but estimates are in the thousands. While the artist painted the earliest ones, later spot paintings continue to be produced by assistants under his direction, sparking questions about value. The cheerful impact of these canvases might at first seem at odds with Hirst's preoccupation with mortality. In fact, they are very much in keeping with it. Each of Hirst's dot compositions mimics the molecular structure of an addictive, potentially lethal substance that cannot be accessed without a doctor's consent. These paintings thus constitute a witty, withering comment on a multi-billion dollar pharmaceutical industry that dispenses drugs like candy. They are also a nod to earlier colorists Hirst admires, among them Gerhard Richter and Mark Rothko. Hirst says, "I was always a colorist ... I just move color around on its own. So that's what the spot paintings came from - to create that structure to do those colors, and do nothing. I suddenly got what I wanted. It was just a way of pinning down the joy of color." Artwork description & Analysis: First on display at the Cohen gallery in 1992 and now permanently on view the Tate Modern, this installation is a detailed replica of a pharmacy. The work is related to the spot paintings, named after pharmaceuticals, but the impact is strikingly different. According to the artist, this work was inspired by walking into a pharmacy and marveling at its ability "to provoke an idea of confidence." The faux pharmacy, as the artist is fully aware, thwarts the expected experience of confidence in this familiar space, and creates a kind of free-floating anxiety. With all the trappings and none of the personnel, the space seems potentially sinister. An additional dimension of the original installation in 1992 enhanced this effect. Holes bored into the walls allowed insects to enter and feed off honeycomb placed around the room. They then flew toward the light and were zapped by the insectocuter. Their performance was a metaphor for the inevitability of death - the end at which we all arrive at some point, and the ultimate futility of modern medicine's efforts to prevent it. Artwork description & Analysis: This floor-based sculpture is comprised of four glass tanks, each of which contains one bisected half of a cow and calf. The white wood frames on each tank evoke the pure, clean lines of classic Minimalist sculpture. Their contents, however, are neither clean nor minimalist. Each animal is suspended above the base of the tank, its front legs dangling limply, deepening the sense of lifelessness. The tongue of the calf lolls out of its mouth. The tanks are installed in pairs, the calf in front of the mother, with space between each pair allowing a visitor to walk directly along the inside of each animal as if through a hallway, observing the pale and intricate internal organs and skeletal structure on either side. The effect is, to say the least, disconcerting, turning a sacred theme in art - that of the mother and child - into a ghastly, graphic, literal dissection. Presented at the Venice Biennale, this was Hirst's international debut. The influence of Francis Bacon, Hirst's friend and major supporter, is apparent in the choice of subject and unflinching attention to gory detail. In focusing on the physical consequences of death, the piece hearkens back to another time-honored theme in western art, that of the memento mori, a class of images devoted to reminding viewers of the inevitability of death and the immortality of the soul. Hirst's work has both these qualities. While certainly a reminder of death, the bodies are suspended in a substance that makes them weightless. When seen from the side, the dissection is invisible and the mother and child seem to ascend side-by-side in profile. As in all of Hirst's installations, the effect of the sculpture is dependent upon the viewer's presence in the space and ability to walk around it. Artwork description & Analysis: Since the very beginning of his career, winged insects have played a prominent role in Hirst's work. For the past decade, he has focused heavily on butterflies, both as symbols and literal materials. This canvas, equivalent to a large stained glass window (roughly 8 by 10 feet) in size and dimensions, is comprised of thousands of brilliantly hued butterflies. The form literally reaches heavenward, evoking religious iconography. Butterflies, traditionally a symbol of the resurrection of Christ, assume a broader significance in Hirst's work, where they are emblematic of ascendance, a theme also found in the animal installations, where bodies seem suspended in midair. Hirst's preserved corpses heighten our awareness of the fleeting nature of life and the possibility of something beyond it. By placing beauty front and center, the work departs from the overtly gruesome presentation of Hirst's more controversial early works, but retains many of its basic methods and themes. Artwork description & Analysis: This sculpture consists of an 18th-century human skull recreated in platinum and encrusted with 8,000 diamonds. According to the New York Times, it was inspired by an exasperated comment from Hirst's mother about his work: "for the love of God, what are you going to do next?" The skull, a symbol of mortality, fits within a long tradition of such reminders. Like virtually all of Hirst's other major works, it ignited intense controversy. The astronomical cost of the materials involved (?15 million) and asking price of ?50 million were considered outrageous. 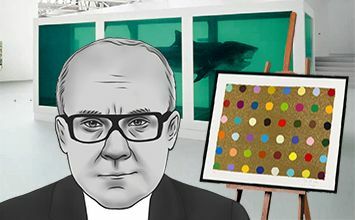 The press eventually revealed that Hirst was among the anonymous bidders for the object, sparking outcry that the piece was nothing more than a publicity stunt. Whether or not this was the artist's original intention, the work brought to light important questions about the astronomically inflated prices of art on the contemporary market. Strange as it may sound, a work that had cost only a few thousand dollars would not be as successful or as interesting as this one. Hirst's brilliance as an artist is inseparable from the publicity surrounding his work; this is literally part of the art.